Jamile do Carmo was born in Cruz das Almas, Bahia, Brazil on 21 December 1972. Very early in life she showed an interest for Plastic Arts and Literature, a duality which accompanied her for a long time after she started illustrating her own books as a child. When she went to college she had to decide between her favorite subjects. At last she decided on studying for an M.A. of Arts, Plastic Arts. 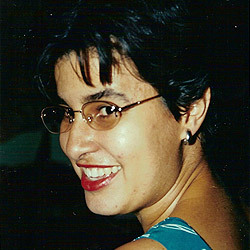 In 1993 she started her coursework in the Fine Arts Academy of Universidade Federal da Bahia (UFBA), where she dedicated herself to studies in Restoration and History of Art. After that she had a post-graduate course on Methodology for Teachers and a 2 years Master's degree in Visual Arts at the UFBA. Her main subjects were art, religion and cultural identities. She worked as an Arts teacher for different elementary and high schools- private and public - in Salvador. She also worked at the IPHAN ( National Institut of Brazilian Culture) in the restoration department, as a substitute teacher in the Fine Arts Academy (UFBA), and in the Pedagogy course at the UNEB (University of the State from Bahia). She attended various further education courses, showed individual and collective exhibitions, and published many texts about Art. Giving she understands art as a language and Esthetica as a rhetoric, her poems and texts are part of her exhibitions. magazines Reflejos, Circulando, Brazine and Unterwasser.